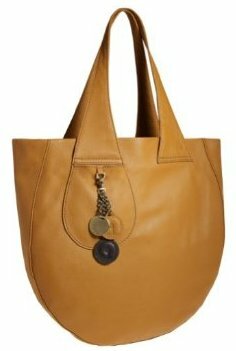 The curved base and asymmetrical handles give the Goldy a quirky artistic feel, but other than that this bag is pretty plain. Its high quality leather shines through, but I find myself looking for some distraction. And when it comes in the form of a cluster of coins, I'm left cold. They just appear a bit messy and uninspired. While the Goldy needs its curved base to set it apart, it's not a very practical design. It's going to fall over the moment you sit it down. While the zippered top ensures your cargo won't spill out, the leather is going to suffer. You'll need to be really careful with this one to keep it looking good. At least the interior is up to Alla Leather Art's usual standard. It's generously sized and well appointed, with plenty of pouches and pockets for keeping your small items organized. I'd probably avoid those open pouches if you can help it though. With the bag prone to toppling over, nothing's going to stay put! If it were designed by another fashion house I'm sure I'd feel a bit more generous about the Goldy, especially considering its very reasonable $289 price tag. It's not a bad bag; I just know Alla Leather Art can do better. The Alla Leather Art Sarah satchel bag, a great alternative to this asymmetrical handle bag.